JENN: This is another story from our 2004 high school orchestra trip to Orlando. It was the very last night of the trip, and we spent the afternoon/evening in the Magic Kingdom. I had been to Disney's California Adventure a couple years earlier where I learned about the recently instituted FastPass program, so the moment we stepped into the park I herded everyone toward the Space Mountain FP kiosks. This was before Moon's Roller Coaster Renaissance, so she made friends with the Tomorrowland Transit Authority Peoplemover. How many times would you say you rode? MOON: Umm... I think enough where I didn't actually have to get off and re-enter anymore! JENN: Did you ever get off and do anything else, or was it just TTA on loop until we got off the ride? MOON: TTA all the way, baby. JENN: Nice! So when our FP return window opened up, we dropped Moon off at the TTA entrance and whooshed merrily through the FP line. The regular standby line was about two hours, if I recall correctly (that's what spring and a school music festival will do to you). JENN: As we walked past the line, we happened to see Moon's ex-boyfriend perched on the line divider. He took one look at us whizzing past and said this: "Oh, you bastards." And that is why FastPass wins. And so we rode Space Mountain AND had time to fit in a jaunt on the Jungle Cruise. TADA! MOON: Dang. I should have gotten on that ride! I'm actually surprised he noticed you guys. JENN: The line was LONG and this was before the installed the video games in the standby queue. There wasn't anything to do BUT notice things. MOON: Even still. You know what I'm talking about. And that is how we used Walt Disney World to triumph over Moon's ex. Truly it is a place of wonder. I wish I would have been musical in High School. It seems as all the bands, orchestras and choirs got to go to WDW! If my orchestra had gone to Disney World I might not have been the ornery second violin I was. 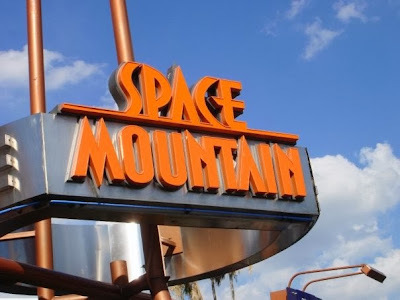 And TTA is the best ride ever and not the death trap Space Mountain is so TTA wins every time in my book. Hey, at least you didn't play third violin! To paraphrase Eddie Izzard: "Third violins play THE NOTES THAT ARE LEFT OVER." I WAS THE THIRD VIOLIN WHEN WE NEEDED THIRD VIOLINS! And I was okay with that. First time ever someone volunteered to be the last seat. Yeah, that's right, I'm not auditioning for you, PUT ME IN THE BACK! I have strangely sparse memories of my senior year band trip to WDW. I remember our entire band had to eat at the Rainforest Café at Animal Kingdom and I was like "OF ALL THE PLACES WE COULD'VE GOTTEN FOOD"
We had that EXACT SAME EXPERIENCE. And even that wouldn't've been so bad except we didn't get to order off the menu; we had to eat off a boring buffet. Adding insult to injury: we went to the one outside DAK, but never got to step foot in the park. But I did purchase my flashlight shark keychain in the RC gift shop, so it wasn't a TOTAL loss. Haha, I think I bought a zebra T-shirt just to have one positive experience at that awful restaurant. They must offer a discount to groups that come in with busloads of students. Blech. I also remember them having a Spanish version of the t-shirt with Winnie the Pooh in a safari outfit looking at a tiger ("Tigre, eres tu?") and have regretted not buying it ever since. Oh well. I'll have to drown my sorrows in yet more wearings of my "Por favor mantengase alejado de las puertas" shirt.